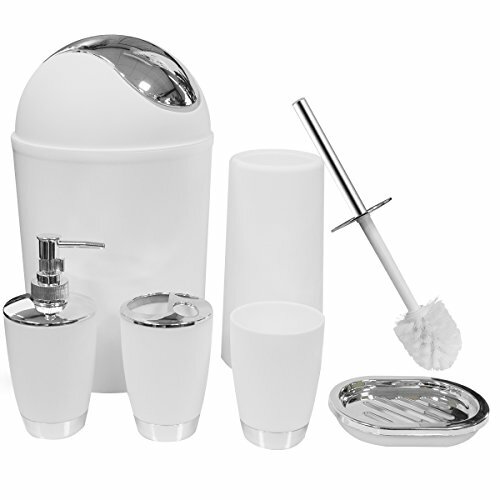 Set of 6 bathroom essentials including toothbrush holder, toothbrush cup, soap dispenser, soap dish, toilet brush holder, trash can, to meet different needs. Easy to clean: Made of high quaility plastic+ metal plating, durable And easy-to-clean. Easy to use: soap dispenser pump come with a wide opening for easy refills, can holds up to 10oz; Toothbrush holder features 3 - holed openings, 2 small ones allow you to keep your toothbrushes and 1 larger hole to place slim toothpaste, making brushing teeth in one grab; Tumbler is great for ringsing, drinking or storing makeup brushes; Waste Bin with Toilet Brush with Holder, one step for decoration your bathroom! Multiple colors: Available in 7 colors to match your needs, black, white, mint green,blue, yellow, red, purple, you can choose the most suitable color to meet your lovely bathroom. Widely Used: not only it is used in countertop,home, bathroom but also for dormitory, hotel, apartment, washing room, basement, RV and etc; Well packaged with a lovely gift box, perfect for your family and friends as a housewarming gift.